Glad you found yesterday’s tips on staying healthy when time is short helpful! One of the foods I mentioned were my juice pulp crackers. When I have the time and energy to juice daily—and it’s rare that I do, but I always do try—I end up with a ton of green juice pulp (carrots, cucumber pulp, celery, parsley, kale, spinach, etc.) on my hands. I love using my pulp up in creative ways. It makes me feel better about the fact that, no matter how wonderful juicing feels for my health, it’s a lot of money spent on produce that gets thrown into a machine. If I can put my pulp into burgers, crackers, raw falafel, and green guac, I feel at peace with my budget and my cravings for tall, cold glasses of green lemonade. 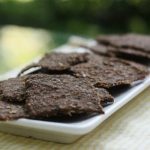 I’ve shared my recipe for juice pulp crackers here before, but in the spirit of sharing with new CR readers, I thought I would share the recipe and the process again. Let’s start with the process: I use a Breville Juice Fountain Plus, a reasonably priced and excellent machine that’s suitable for someone like me, who likes juice frequently, but isn’t conducting big juice fasts or juicing several times a day. If you have a juicer like mine—or even a more expensive Green Star or Hurom model—there is most likely a part of the machine that “spits out” the pulp that results from juicing. If you’ve already given this some thought, you probably put a plastic bag in this part of the machine to collect the juice pulp; if nothing else, it makes for an efficient and easy disposal of what can be a messy hunk of juice pulp. What I do when I juice is to use two bags. Into the first will go all parts of my juice that I don’t ultimately want in my juice pulp crackers, burgers, or dips. So, I don’t personally like the taste of fruit in these things. I place a plastic bag around my juice pulp bin and juice all fruit, lemon, and ginger (or lime) first: those are essential parts of my green lemonade, but I don’t want them in the pulp I’ll use. After I juice them, I toss out their bag of pulp. I put a new bag in (it doesn’t matter if the machine is sort of messy as you’re doing this) and then I juice the remainder of my ingredients: celery, cucumber, parsley, spinach, kale, carrot, etc. This is the pulp that later gets used in food. I find that it must be kept very cold and used very quickly, or else it spoils, so I use it at once or save it in a cold fridge for a day at the very most. As I said above, there are all sorts of recipes I use my pulp in, but the following crackers are most oft repeated. 1) Blend all ingredients save the water in a food processor. Add water in a thin stream till the mix is easy to spread, but not watery (the amount of water you’ll need will vary based on how watery the pulp is). 2) Turn the “dough” out onto a teflex dehydrator sheet and spread it evenly. 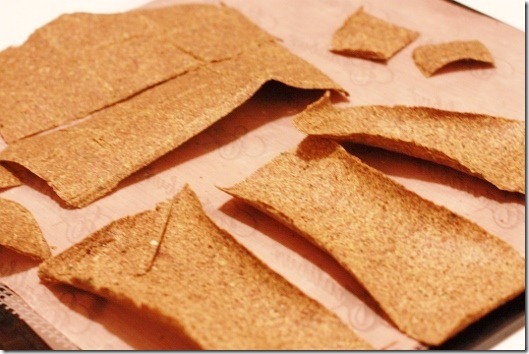 Score into cracker or flatbread shapes–I tend to do half and half of each! 3) Dehydrate the crackers at 115 degrees for about 4 hours. Flip the sheet by putting another teflex sheet over it, flipping it over, and then peeling off your original sheet. 4) Dehydrate for another 4-5 hours, or until crackers are nice and crunchy (again, this time may vary based on how watery your pulp was). 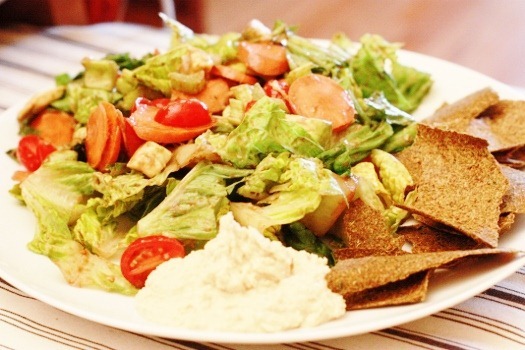 5) Serve with salads, hummus, or as you please! 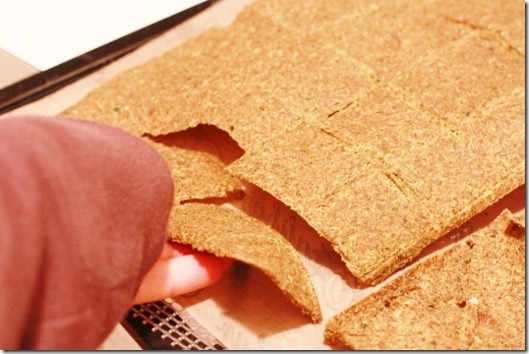 Oven option: bake crackers at 325 degrees for about 30 minutes, checking on them often to be sure they’re not burning. 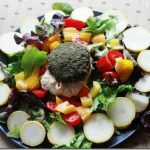 Use your kitchen intuition! They are light, crispy, and totally addictive. A staple in the CR kitchen. Don’t be wasteful! If you own a juicer, give this guys a try soon. And if they’re not inspiration enough, I’ll have a new juice pulp based burger waiting for you in a day or two. For now, happy Fridays—see you tomorrow! 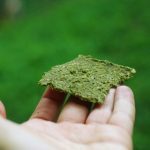 Crowd Pleasing Green Crackers and an Exciting Announcement! I love these crackers and have made them a few times! Very interesting on your pulping process, I have a similar Breville juicer that I don’t use enough because of busy weekday schedules and I have to plan to use the pulp to and not waste it. I love how you said Don’t Be Wasteful. Yes! So true! I have a few friends who are just getting into juicing and they are buying 100% organic produce to juice..and then just dumping the pulp. I’ve told them, no, save it!! You can make things with it…like crackers or cookies or whatever. It’s amazing what some seasonings/sweetener/spices/etc can do for some pulp. I love that you save it. And that you have have a collection technique for it, i.e. what you do and don’t ultimately want in your final product and you plan accordingly for that. Gena, could you share a recipe to use up nut pulp that DOESNT require a dehydrator? i’ve fallen in love with homemade almond milk, but i dont know what to do with all my pulp, and i dont have a dehydrator! help! -salt to taste, maybe 1/4teaspoon? Incorporate into 1 cup of almond pulp, with 1 tablepoon dried DILL. This is soooo very good! I plan to put it on my blog soon, but I have only just started up, and I have 3 children so I am kept busy. I hope you try it. It’s delicious. If anyone is still reading this thread, here is the post. Gena, your site is amazing. I have not even got round to finishing my blogroll on my new blog yet…but you have been on it since day 1! I just made my first crackers with almond pulp and juice pulp in an oven and it worked fantastic! I want to share how even though this post is 2 years old in case anyone else wants to know. For the same reasons as you – had all this almond pulp left over and didn’t want to waste it. Even non raw hubby loved them too. I’m a “throw it all together and see” kind of chef,(see “recipe” below) but I aimed at getting a pastry like consistency – ie not too moist as that would take much longer to dehydrate. Scored with a knife. Dehydrated in a regular oven on fan setting at around 40 degrees C (I wanted to dehydrate rather than bake). Kept door slightly open with a wooden spoon. About 6 hours or until nice and cracker-y. Turned over half way through. Kept turning until dry all round. 1 1/2 cups veggie pulp (from juicing) – maybe more. I’m going to try again today without the almond pulp. Thanks for including the oven directions and for re-teaching an old recipe! These crackers look perfectly crunchy. I love how thin and crispy your crackers look. I use the pulp for crackers, burgers, desserts etc., but I still end up with more pulp than I can use (I juice a lot…). I started a garden this year, so I am now making compost and compost tea. I recently posted about a cool (I think), handmade, largely reclaimed/recycled rolling composter that we made last weekend. I always enjoy seeing what can be made with the pulp, but must admit I am rather smitten with my composter as the fall back option. Question – When baking these, what kind of tray do you use? Just a regular cookie sheet? Anything underneath? I’d do parchment on a regular baking pan. Awww, thanks. I try to pride myself on balance. Ahhhh I have SO much juice pulp in my fridge and I was too scared to improvise on a juice pulp recipe….thank you G, me and Lisa will probably try these out this weekend!! Although I can’t make these because I don’t have a juicer, I appreciate your recipes like these because intentionally or unintentionally, they are good for the environment because one is wasting less by using up all the produce as possible! Yay environmental friendliness!!! Yes! You were a great guest. I just got a dehydrator a couple of days for my birthday. Can’t wait to try some recipes! What kind of dehydrator do you use?? It’s about time I bought one! I want to be able to enjoy juice crackers, but both times I made and ate them, I became *extremely*, painfully bloated shortly thereafter! I’d never heard of this happening. I’m guessing because it’s essentially all fibre? I normally eat a high-fibre diet and drink a lot of water so I am miffed by this. Could you be allergic to flax? I know a few people who are. It might be all the fiber! Sounds yummy, and actually a good argument for owning a juicer! I hate waste and love to use all parts of a food. I don’t have a juicer (except for a handcrank wheatgrass juicer) but when I’ve done cheffing work, I’ve always made sure to put the pulp to use. Oh no! Hope it fixes itself too. When I use to juice all the time- that is, when I had time and a life- I had quite a bit of juice pulp waste leftover. I just ended up composting it all. 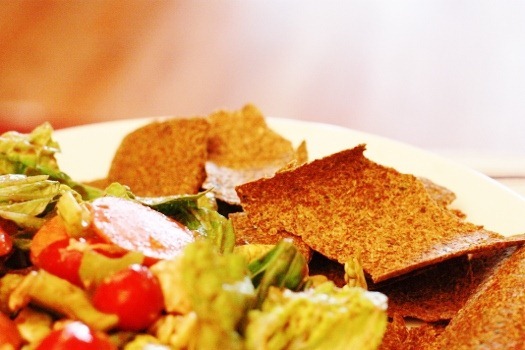 I’d love to try these crackers out- they look heavenly! I have a problem with using the pulp because I find that if I don’t use the juice that day (as you said), it just goes bad. With the hurom, it actually produces less pulp, so you have to juice a LOT to get 2 cups of pulp. So I really would have to save it up over days, or just juice extra and save the juice (or share it). So I don’t find I use juice pulp very much, and I don’t mind “wasting” it because I know my juicer is really extracting a lot out of it. I don’t let the fear of “wasting” the pulp prevent me from drinking juice. I have actually dehydrated the pulp, then made it into a green powder which seems to work better for me. My old pup who passed was the best, he ate my juice pulp, and shared my juice. That was the best of all. I think juicing is worthwhile no matter what, even if you toss the pulp. But it’s nice to use it all up. What a sweet memory about your pup. Exactly, I don’t let the fear of waste stop me. Some say it does. Does the pulp really go bad after more than 1 day? I know a lot of people who save the pulp for a few days. It doesn’t smell… So is it still ok to use? Can chia be used? What other binders are possible? I love this idea for not wasting pulp! What if we don’t have a dehydrator? Would just baking them work? Yup! There are actually instructions in the post. alll yes I see it now. 😉 thank! These look crispy and yummy! Will definitely try these. I love using up my daily juice pulp too! Someday, hopefully sooner rather than later, I am getting a juicer! And I’m already thinking what do you do with all of that pulp? What a shame to throw all of that fiber away! So thank you for answering my questions!!!! It’s good to know that you can make yummy things out of the pulp. I just bought that very same juicer after watching Fat Sick and Nearly Dead (awesome documentary that features a man on a juice fast) And I love it…thanks for the tips on how to use the pulp, because I have been feeling very wasteful just throwing it away. Can’t wait for the veggie burger recipe. Question about the Breville…can you juice whole lemons, rind and all? I really want to try your green lemonade, but not sure how to juice the lemons. Sure can! Quarter them first. I have a dehydrator, but i’m not sure about those sheets.. in the picture it looks like parchment paper. Could i use that? I think my dehydrator just has the “net” looking shelves. Thanks! It’s Teflex, but parchment would work too. This recipe looks great. My mum got me a juicer a few months ago, but I’ve balked at using it because of all the ‘wasted pulp’. Now I can put the pulp to good use, I will try and juice more often. Thanks! Oh thank you for this recipe! Being very budget conscious, I really hated the feeling of throwing all that good, organic juice pulp away. I like using every last bit of my veggies! Looks yummy, I’ll have to try some! 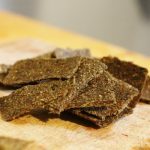 I remember when I first heard about using pulp for crackers, I thought it would be as easy as just spreading the pulp out on the dehydrator sheet without mixing any other ingredients with it first. Let’s just say that that wasn’t the case! It’s times like these that I wish I had a juicer just so I could make your lovely “conservation” recipes. I also wish I had a dehydrator, but I think that is a little less irrational :D. Congrats on the DC move! Just used this as a template for my first pulp crackers. Delicious! Thx for the info on pulp crackers! 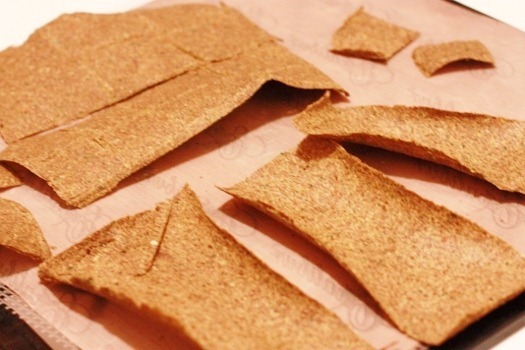 I came up with a tip to stretch the waste pulp even further and to get the crackers to dehydrate much faster; it is easiest if juicing daily, so as not to create extra clean-up. Note: I’m using a Green Star with double gear drive. After juicing, place the pulp in a tupper-ware, pour in just enough water for the pulp to rehydrate, place the cover on, and refrigerate till the next day. Run the pulp through the juicer again and use the liquid for miso soup (stretch those food pennies); this saves me from having to steep the vegetables in a pot. Then mix up all the chip ingredients in a food processor, or just by hand in a big bowl; the second method requires far less water and therefore much faster dehydrating. Next, I lay a non-disposable or disposable dehydrator sheet on the counter with the pulp mixture centered; I place another one (or wax-paper) on top and roll it all out flat with a rolling pin. If the pin won’t roll: hang on to the pin and make it roll with your hands, rather than using the handles. If the pulp mixture overruns the edges, just use a plastic knife to trim, while using the sheet as a guide… this gives nice even edges to the border. Peel off the wax-paper with a horizontal pull, not upward, so that it doesn’t ruin the nice slab of pulp. Slide/drag the bottom sheet onto the dehydrator’s removable shelf, and load it in the machine. Finally, turn the unit up to 135 degrees Fahrenheit for 60 minutes only, so the machine can vent off the the excess liquid quickly. Then, turn it down to the usual 115 degrees. Typically the chips are ready to flip onto a different shelf with a mesh mat, just after 60 minutes. I don’t think the initial increased temperature cooks the food because the food temperature seems lower than the forced air’s temperature. How long can I keep the juice in the frig? I’ve not juiced in a while, partly because I always felt bad about the pulp, so this is great news to me. Here’s my question: Can you freeze the pulp? I can’t think of a reason why not, but would like your take. Thanks. 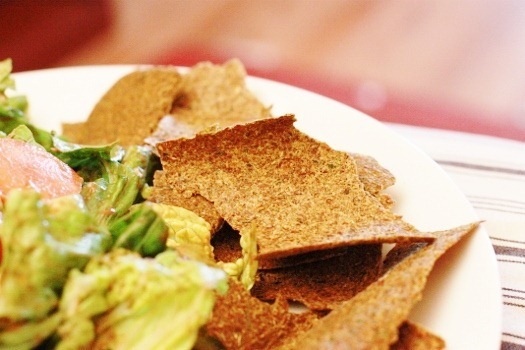 I don’t have a dehydrator, so am going to make these in a regular oven. My question is do you recommend parchment paper, or should I just oil a non stick pan and even out the paste/dough in it? Please advice, I am new to this, but don’t want to waste my daily juice pulp. Anxious to try the crackers! fantastic! can’t wait to try it. we sometimes grind the pulp in the blender and add it right to our juice, and other wise it goes to the chickens. Now we’ll have another way to use it in our gluten-free house! Thanks! Thank you for this recipe! I hate wasting the pulp after juicing and have been looking for another use for it other than pies, compost, etc. 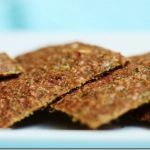 A suggestion for your fruit pulp –following the same cracker instructions, switch the flavorings to honey, cinnamon, and vanilla –my kids call them homemade graham crackers! Oh my. That sounds wonderful.